Many of the sites visited by travellers on tours of Wales in the eighteenth and nineteenth century like Snowdon, the vale of Llangollen, or Caernarfon Castle are familiar to us today as tourist attractions and sites of interest. It was common for tourists keeping journals to also note down the places they stopped or slept at and make notes of the quality of accommodation. These can give an insight into the challenges of travel in the Romantic period and the necessity of forward planning in order to make sure you had a bed for the night. One inn that became particularly popular because of its location on the road to Holyhead, situated mid-way between the popular beauty spot of Betws-y-Coed and the town of Corwen was the Cernioge Inn. This is a place which has today almost disappeared off the map. Map from Rev. 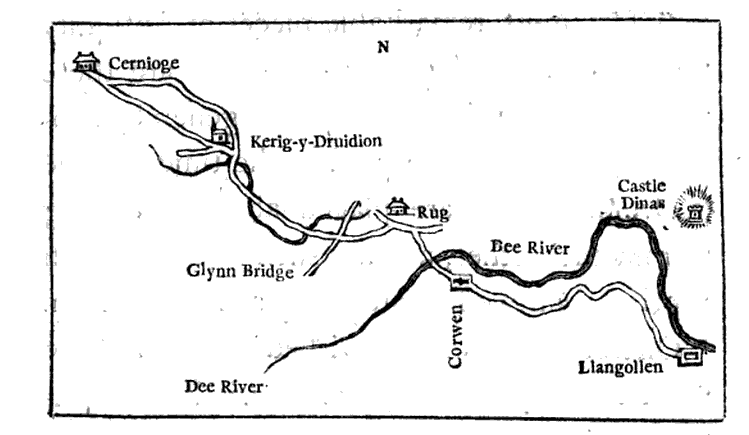 Richard Warner’s, A Walk Through Wales, 1798. The main inn (it was known in 1795 as the Prince Llewellyn) survives beside what is today the A5. Its stable block on the opposite side of the road is more remarkable than the inn itself, and is what catches the modern traveller’s eye. 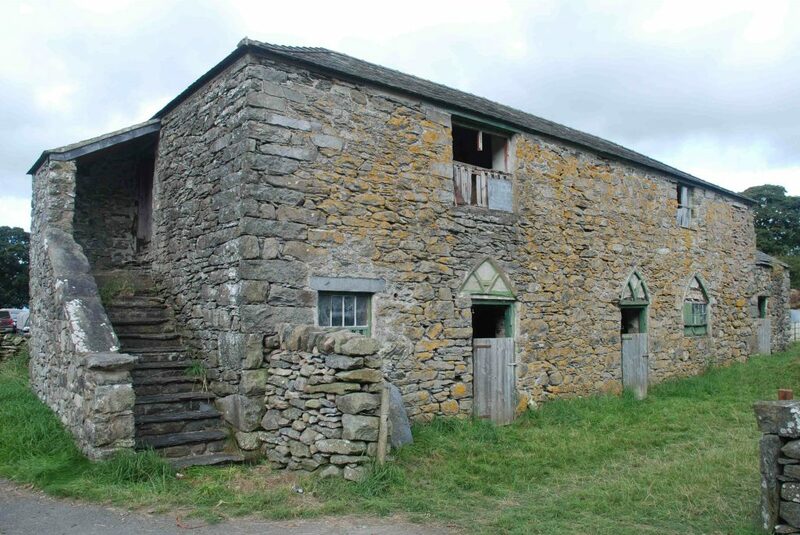 The stables of the Cernioge Inn near Glasfryn are today a barn on an isolated farm. Author’s photograph. When the site was visited during research for the Council for British Archaeology report on the history of the A5 (2003) the interior of the inn building had been altered, but the stable block was largely unchanged. It still contained two stables with pitched stone floors, drains and hay mangers, and upstairs was divided into two plastered chambers with fireplaces (perhaps lodgings for the grooms). Christopher Rawson and his brother stayed at the Cernioge Inn in 1817. At this inn you meet with the best accommodation in N. Wales & the greatest civility. Kept by a Mr. Weaver, whose wife was lately a servant of Mr Abletts. It stands in high repute on this road & all the travellers from Ireland prefer sleeping here to any other. Excellent beds & the choicest fare. Miss W his daughter, an excellent performer on the harp & sings Welch airs. Christopher’s brother William recommended the Cernioge Inn to their Halifax neighbours the Listers of Shibden Hall. It seems that they took his advice and Anne Lister stayed there with her aunt on their Welsh tour in 1822. Anne records in her diary enjoying a good dinner of trout, mutton chops, and gooseberry tart and cream. She also mentions purchasing a copy of Nicholson’s Cambrian Traveller’s guide from Mr Weaver the landlord. With typical attention to detail Lister records that she purchased a copy of the second edition, published in London in 1813 in one octavo volume, and that it cost 18 shillings. The surviving inn building is through to date from Weaver’s time, although the first recorded licence for an alehouse at Cernioge Mawr is 1772. The importance the inn once had as a staging post where one could change horses is attested to by the milestones, which can still be seen today. Milestone near Glasfryn on Thomas Telford’s road through North Wales (now part of the A5). Copyright Keith Evans. Reused under Creative Commons Licence from Geograph. It is said that Queen Victoria (then Princess Victoria) stopped at Cernioge for tea in 1832, but within a few years the inn would be closed. 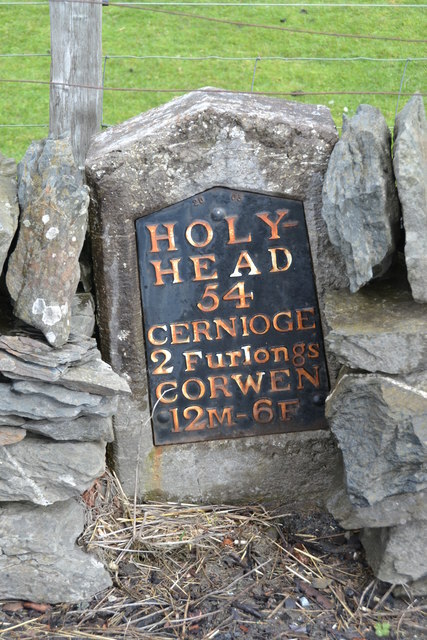 Probably Cernioge had gradually been losing business to other hostelries including The Saracen’s Head at Cerrigydrudion. The building was a farmhouse when George Borrow visited the area in 1854. I walked on briskly over a flat uninteresting country, and in about an hour’s time came in front of a large stone house. It stood near the road, on the left-hand side, with a pond and pleasant trees before it, and a number of corn-stacks behind. It had something the appearance of an inn, but displayed no sign. As I was standing looking at it, a man with the look of a labourer, and with a dog by his side, came out of the house and advanced towards me. “What is the name of this place?” said I to him in English as he drew nigh. “Is it an inn?” said I. Should you be passing along the A5 it is worth stopping to have a look at this remarkable remnant of coaching days. 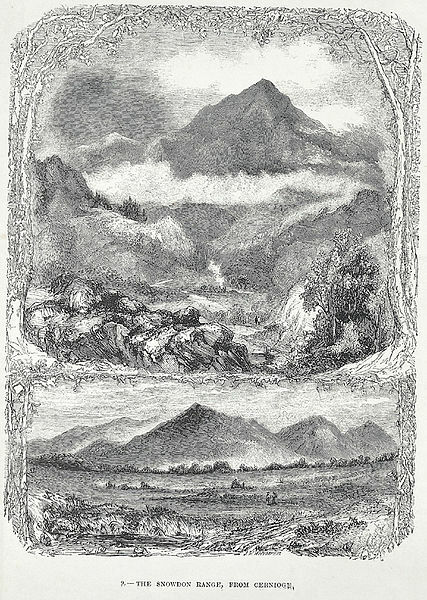 View of the Snowdon range from Cernioge, engraving by Josiah Wood Whymper c1875. From the collections of National Library of Wales. Christopher Rawson’s travel journal 1817-1822, WYAS: Calderdale, WYC:1525/6/5/2. Anne Lister’s diary, 1822, WYAS: Calderdale, SH: 7/ML/E/6. WH Rawson’s advice on Welsh roads sent to A Lister, received 4 July 1822, WYAS: Calderdale, SH: 7/ML/117. George Borrow, Wild Wales: Its people, language and scenery, first published 1862. For information on Welsh inns see here. This entry was posted in Research Blog on 21st February 2017 by Luca Guariento.